Interested in owning your own RF Spectrum Analyzer ? yet, Inexpensive 1000 MHz Spectrum Analyzer. 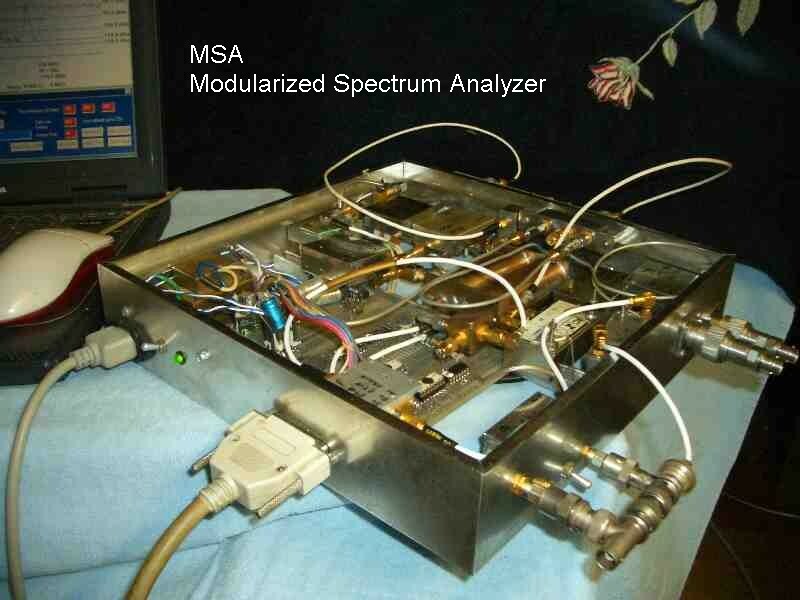 The Original MSA, mated with a laptop computer. Not pretty, but works quite well. The newer version, the SLIM MSA. Same concept, but constructed using Standardized Laboratory Integration Modules, SLIM's. The MSA project was started in Jan, 2001 and has evolved under several titles. If you want to build your own Home-Brew 1000 MHz Spectrum Analyzer, you already have half of it completed. That half is the computer you are using to read this. The processors and displays are very expensive portions of modern spectrum analyzers, and those functions can be replaced by your home computer. The computer's monitor is the Spectrum Analyzer's display. The other half is the MSA hardware, to be constructed (as seen in the photos). The MSA Software is free to download. It will operate on any computer with a parallel port, USB 2, or USB3 and any Microsoft Windows platform. USB operation has been tested using Win ME, Win XP, Win7, Win8, and Win10. Previous visitors to this Site will notice significant changes. I have deleted most references to previous versions of the MSA and will concentrate on the MSA using SLIMs, Standardized Laboratory Integration Modules. The previous designs and web pages are retained in the MSA Archives, for those who need the references. The SLIM MSA does not obsolete the Original MSA design. The Original MSA will continue to be supported in the software. The title of this page and the opening paragraph seem to indicate that the Function of the MSA is a Spectrum Analyzer with operation limited to 1000 MHz. This was my original concept and design goal. However, software and hardware additions have allowed the MSA to provide many more Functions than just that of a Spectrum Analyzer. The Functions depend upon the level of construction. There are 3 Build Levels of the MSA. PC or Laptop Computer (any speed), with USB 2 or LPT standard or enhanced parallel port (SPP, EPP). Monitor can be any size, but MSA software uses 800 by 600 pixel resolution. Windows 98 or later. MSA software is executable, but builders who wish to modify the MSA software will need Liberty Basic 4.03. The Liberty Basic is free, but it will nag you to buy it. Go visit their web site at www.libertybasic.com. Construction of the SLIM MSA, a Construction Guide for integrating the MSA using Standardized Lab Integration Modules. The Basic MSA, Tracking Generator addition, and Vector Network Analyzer extension are covered. Specifications for the SLIM MSA and links to pages for the construction of the individual SLIMs. Construction Hints. Hints on constructing the SLIMs. It may save you a lot of potential grief. Initial Set-Up and Calibration of the MSA, including instructions for downloading the software. Test-As-You-Build, A test procedure for SLIMs as they are built and integrated into the MSA. Testing the Integrated MSA, A test procedure and troubleshooting guide for a fully integrated MSA. Control and Operation of the MSA is common to all Build Levels of the MSA. A description of screens, controls, and operation. Technical Analysis of the MSA. In-depth circuit analysis. Very handy for troubleshooting the MSA. Temperature Testing of the MSA. Testing the MSA/VNA for temperature induced error. In-work. SLIM Web Page. The Standardized Laboratory Integration Module philosophy and links supporting the SLIMs. Coaxial Cavity Filter, description and construction of a high-Q, 1013 MHz bandpass filter. USB control for the MSA. MSA Archives, old stuff no longer maintained. Use it, but many links don't work. I will repair them as time permits. MSA Builder's Group, for those interested in sharing ideas on the MSA. There are many people in the process of building or using the MSA and can offer suggestions and comments. This is a Yahoo Group page and you are welcome to join and contribute. Wide Band Leveler. An AGC Amplifier with constant output amplitude, for calibrating the MSA. 1 MHz Calibration Source. Sine and Square Wave Generator, for calibrating the MSA. OSL Standards. Construction and explanation for precision open, short, and load for use with the VNA. Attenuators. Precision fixed and switchable attenuators. Reflection Bridges, passive and active. For use with the MSA/VNA. Test Fixtures. Series and Shunt Test Fixtures. Used as test bridges with the MSA. House Dillon Site, pages of his MSA construction. I will try to answer your questions or comments as soon as possible.